Can you tell us about you and the correlation between your work and female identity? My work is about exploring the self in nature as well as the nature within the self. Specifically, in my collection titled Anima, I explore feminine identity through animal archetypes and symbolism. People, of course, are animals too, but other animals have this unspoiled way about them, a way of being in tune with things on a deeper level. There's something really raw and beautiful about that. Connecting women and animals in this way is really about connecting back to the innate and intuitive qualities that make us who we are. On both personal and universal levels, animals are representative of different traits and concepts — foxes are associated with slyness, fawns symbolize innocence. All of these things came to be through people's stories and experiences, fears and discoveries, scientific studies and attempts at making sense and meaning. Do you ever notice that a lot of people have a specific animal that's "their" animal? Well, that connection exists for those very same reasons, whether we realize it consciously or not. As a human being, and as a human being who identifies as a woman, I am constantly interested in aspects and characteristics that define us: Why are we the way we are? Why are we drawn to certain things? Why do we act certain ways? It all comes down to identity. Identity is an essential question, something that preoccupies everyone, but because of a history of oppression, women face this question very differently. We have to first get through an onslaught of cultural, social, and historical naysayers before we can get down to the core of who we really are, or what we really can be. It takes a lot to tackle that. Some of my female role models are artist Georgia O’Keeffe, actress Audrey Hepburn, musician Laura Marling, and writer Cheryl Strayed — women who express themselves and take risks and care about the world, who are kind and fierce and beautifully deep. These are the women in my paintings. Not specific individuals, but embodiments of specific characteristics. My work is largely about women, but it is for everyone. We are all living and breathing on the same big hunk of dirt, and we all have something to learn from each other — ugly and beautiful. I've always been profoundly drawn to nature and animals, and because of that I spend a lot of time outside. I'm especially enamored of the landscape and culture of the southwest U.S., just how open and broad it is, alive and weathered in a way that's unlike any other place on earth. To me, the desert is this apogee of existence where life and death are in perpetual dance. There are weird trees coiled in deadwood and cacti topped with colorful flowers; there are boisterous winds and stone-dead silences; unbearably scorching days and bone-chilling nights; flash floods and grounds cracked by dryness; there are buttes popping up between endless miles of flatland; colorful canyons and whitewashed sands; there are coyotes chasing rabbits chasing plants chasing water; and turkey vultures watching like gatekeepers from the skies, judging the remnants they will clean from the slate. The sands sweep over all of it like a wave of stars, claiming the bones and laying cradles for the footprints of new life. The desert is a land of extremes. Life and death exist in such contrast here that existence itself is so strikingly apparent — and that’s precisely what my work is about. How has your upbringing shaped who you are today? I grew up in the garden in my backyard, climbing trees and walking around with no shoes on. I constantly grab onto that feeling of being barefoot — of skin to earth. My parents never scolded me for not wearing shoes. They encouraged me to play outside and have fun even if it meant getting dirty. I viewed muddy hands and splinters like badges of honor, proof of my adventures (and misadventures). I was constantly wandering off, slipping quietly away and returning before anyone would notice. Looking back, I'm pretty lucky I never got lost, or worse. I grew up in a loving household where dreams were things you could attain and help was always there if you needed it. Both my parents worked, yet I have no memories of my parents not being able to do things with my brother and me because of work. As a high-ranking executive, my mom set a really good example of how women can be independent and influential, and how they can pave their own life paths. I actually don't think I really realized there was a difference in what men and women "could do" in society until I got a little older. I remember quitting Girl Scouts in elementary school because I got mad that we were baking cookies while the Boy Scouts got to go camping. I spent a lot of time with my dad, hanging around the cars in the garage or helping with yard work. He liked to show me how things functioned: the inner blueprints of clocks and engines and what was holding up the walls of our house. He used to pick my brother and I up from elementary school in our 1981 Corvette. I'd sit huddled next to my brother, watching the sky glide past through the T-tops because I was too small to see out the windows. I was always making things, assemblages of sticks and stones, crayon murals on the walls in the hallway, notebooks filled with stories and drawings. My mom never bought me coloring books. Instead, she'd bring home endless stacks of paper from work that would've otherwise been discarded. I'd draw on the backs of meeting agendas and training certificates. Sometimes they'd be printed on really thick stock, or dyed in fancy cream colors. I went through piles — and my mom saved them. Making things just came naturally to me; it was something I always did and couldn't help doing. There weren't any other artists in my family, and I was my parents' first child, so they didn't really realize art was my "thing" until my preschool teacher exuberantly told them that I "had to be enrolled in art" because "preschoolers just don't draw like that." They nurtured her urging full-throttle. I ended up taking lessons with an art teacher named Carolyn Lyford Catalano, who taught me to paint what I saw, even if they were colors and shapes that no one else saw. She became a strong maternal figure in my life, teaching me to take risks and chase my passions, even if it meant facing criticism. She and I are close to this day. I call her my "art mom." I have always been naturally curious of everything. I grew up quiet and introverted, but was also strangely forward. I asked a lot of questions. I turned over rocks in the garden. I stopped to look at dead birds. I rescued roly-poly bugs from the sidewalk and stuck my hand in a stream just to watch the water flow across it. I wore dresses with jeans and boots and wide-brimmed hats and refused to cut my hair. I've always been small and kind of shrimpy, and maybe that fueled a need to make something of myself. Some people made fun of me, but I can't remember much of what they said. I didn't really care. I carried my private world in my sketchbook and guarded it like the precious sanctuary it was for me. I got lost in my drawings. I got lost in books. I remember playing in my imaginary world one day during recess, only to look around and see that the playground was empty and all the kids had been called back in. I’ve always had friends, but I’ve also always been happy being on my own. My first best friend was our family's Alaskan Malamute, a big wolfish dog named Patch. He'd pull my brother and me in a sled down the hill in our backyard, and I'd curl up in his fur until both of us fell asleep, our breaths in unison. Today, I have a wolfish dog of my own, Cobalt, and he goes everywhere with me. I mentioned earlier how people have that one special animal? Wolves have always been mine. In moments of adversity, how do you build yourself back up? When I'm feeling self-doubtful or existential, I remind myself that I've been given one life to live and the power to do with it what I choose. I've got this life; I might as well use it. Some of the best pieces of advice I've been given begin with the words "let yourself…" Let yourself wander. Let yourself decide. Let yourself cry, rest, laugh, BE. You are the only one you need permission from. My work is about finding internal strength and channeling it into external strength. I want the stories living inside my art to empower those standing outside of it. I want to pull them in so that they can jump right back out with something of value. It's like potential energy combined with the ripple effect — a thing that inspires me has the potential to inspire someone else, and someone else, and someone else — but that never happens if you don't explore and share what you discover. It's all about making connections, within and around us. We just have to get out there and make them. Stephanie Lenchard-Warren is a fine artist and illustrator whose work explores the self in nature as well as the nature within the self. 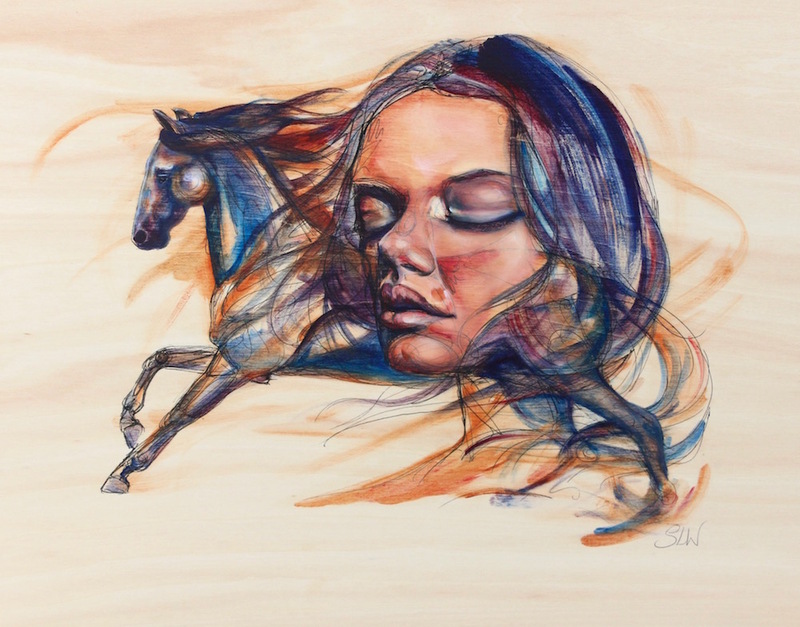 She is known for her expressive figurative work of women and animals incorporating ballpoint pen, oil paint, and bare wood.Drawing from animal mythologies and archetypal histories, Stephanie's work underscores our inherent connections with animal life and the roles their personas play in our own identities. With specific focus on feminine identity and representation, her work displays how these symbolisms intersect to embody an empowering spiritual rendering of our nature and the animals we share it with. See more of her work here.